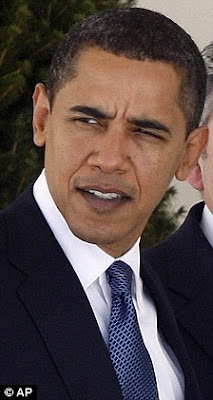 13 Above: Is Obama Hiding His Grey ? He was one of the youngest men ever to be sworn in as president of the United States. Yet Barack Obama apparently believes he did not look youthful enough. While his wife Michelle rises at 5.30am every day to hit the gym and maintain her toned arms, Obama seems to have adopted a new grooming routine of his own. Recent photographs of the new president reveal almost jet black hair, while in pictures taken during the campaign trail Obama sports many grey hairs on the top and sides of his head. Unless the president has discovered the fountain of youth in the Oval Office - or installed extremely flattering lighting - the change could only be down to the skills of a hairdresser or a home dye kit.While grey hair during the election campaign may have helped Obama refute Republican claims of inexperience, he could now be keen to a appeal to a younger audience. Where's the grey gone? 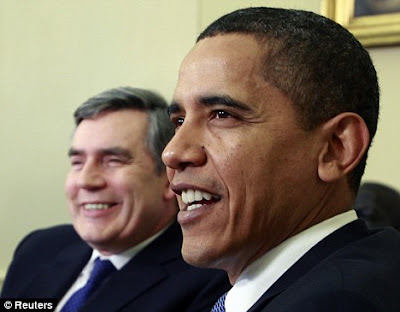 :) Obama smiles alongside British Prime Minister Gordon Brown during their meeting in the Oval Office. The youth vote was instrumental in Barack's selection as Democratic candidate and eventual victory, so perhaps the 47-year-old feels the need to update his look to maintain his hold with the younger generation. 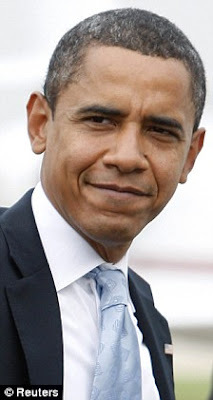 Obama, the 44th president, is the fifth youngest person to assume the office of president, behind Theodore Roosevelt , at 42, John F. Kennedy, Bill Clinton, Ulysses S. Grant and Grover Cleveland.